With my previous posts I have shaped a series of blogs on the European Conference of Educational Research (ECER 2018) that took place last week in Bolzano/Bozen. In the first post I reported on the pilot with ePosters powered by the digital toolset Learning Toolbox (LTB). In the second post I gave an overview on my own contributions – on the research background of the LTB and on ‘transfer of innovation’ issues in recent and earlier innovation projects. In the third post I reported on the Opening Session of our VETNET network (European Vocational Education and Training Research Network) and on some contributions of our Italian colleagues. This fourth post will give insights into some of the VETNET sessions that I attended. Here it is worthwhile to note that I don’t try to cover the whole VETNET program nor the sessions that I attended. Instead I try to draw attention to some specific presentations. My colleagues Werner Müller and Ludger Deitmer presented the newest phase of the German project DigiProB. 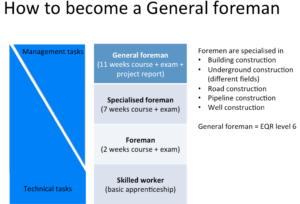 This project focuses on a Continuing Vocational Training (CVT) model that outlines a purely vocational progression route to higher qualifications. 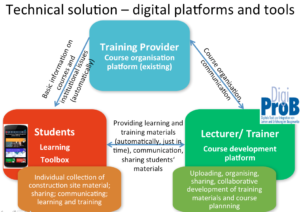 As we reported in ECER 2015, this training model has been renewed in such a way that it is not only based on subject-specific courses but – also – integrated with complex working and learning tasks and by an integrative project report. Now, in the present phase of the project, the colleagues could report on the shaping of the software ecology that had been developed to support the training and learning processes. Ten years European Qualification Framework (EQF) – A success story? In another session Sandra Bohlinger took as her starting point the ten year anniversary of the European Qualification Framework (EQF). In her presentation she had a number of quotes that presented the ‘promises’ at the beginning phase and the others that celebrated the ten years as ‘success story’. However, looking closer to the development during these years she presented a more differentiated picture. Surely, the number of countries that have adopted the framework is larger than the number of EU Member States. And for countries that experienced a transformation from planned economy to market economy the framework appeared as an appropriate support instrument. However, the key message coming through from the evaluation studies that have been carried out recently is that no there has not been such an impact at the European level as had been expected. This, as we discussed in the session, is quite an impact itself when thinking of European policies. Another interesting session was composed as a symposium that brought together different perspectives to using technologies as support for vocational learning. Marianne Teräs introduced the symposium and presented the palette of presentations and as contributions to ‘use of technologies’ or challenges with technologies in the context of vocational learning. Two of the presentations focused on simulations in the healthcare sector whilst the third one discussed the relations between ‘high’ and ‘low’ technology in a developing country. Vibe Aarkrog presented her action research project in which she studied learning simulation-based arrangements within nursing education. She gave us insights into her research design and into the discussion on ‘high fidelity’ simulations vs. ‘low fidelity’ simulations. Then she drew attention to different scenarios (framing the learning situations) and to possible interventions of teachers. 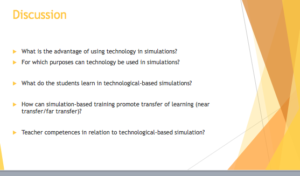 At the end she raised several useful questions on the role of simulations as support for learning. Paula Poikela presented her research on the development of simulation-based learning in nursing education. In this context she gave us insights into the earlier models of computer-based simulations, to the emergence of web resources, mobile devices and wearable technologies. She also drew attention to different waves of simulation in healthcare sector, starting from arrangements for medical doctors and then shifting to specific simulations for nurses and to arrangements that involve different healthcare professionals. 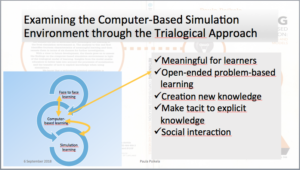 She concluded her presentation with a trialogical approach to examining meaningful learning based on simulations. In the final presentation of the symposium Lazaro Moreno opened a different perspective to using technologies to support learning. 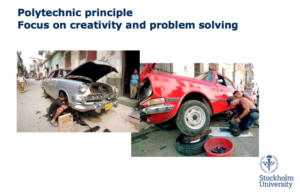 He told of a new project in which he studies the training for automotive occupations in Cuba. He gave us a picture of a huge gap in resources and equipment by comparing a) companies that bring brand new cars and maintenance software to serve the tourists and b) vocational schools that train their pupils to repair the oldtimers that are used by local people (and have at best very old computers). With this contrast he drew attention to the principles of polytechnic education – training creativity and problem-solving skills. The symposium was characterised by a lively discussion in which the colleagues added further aspects to the theme ‘supporting menaingful learning’. Also, the participants emphasised the difference between technology at work and technology for learning. These may not necessarily go hand in hand – and this may provides chances for meaningful educational interventions. I guess this is enough of the VETNET sessions. Although this report is far from a comprenehsive coverage, it nevertheless shows the richness in content. In my final post of this series I will focus on the VETNET network and its general assembly. In my previous blog I wrote from a personal point of view on the coming of a new era. But, of course from a global point of view I have a stronger reason to use the expression ‘change of era’ when referring to the end of the Obama presidency in the USA. It is not my habit to comment the politics of other countries on my blog. Therefore, I will not make comments on Obama’s successor and what to expect of his presidency. What I want to do at this point is to celebrate the outgoing statesman and the special Obama moments during his years of service as the president. Much of this has been written and will be written elsewhere. So I limit my remarks to personal experiences and to observations on recent events. Far more strongly I experienced the re-election of Obama in 2012. I was on other duties in Berlin and then continuing from there to Barcelona to attend the Learning Layers kick-off meeting. The elections in the USA took place on the very night that I spent in a hotel in Berlin before my morning flight to Barcelona. At this time there was much at stake and the result of the elections was not clear before the critical day. So, I just couldn’t get sleep and turned the TV on to follow the program of the German TV-channel ZDF. So the night passed, there were moments that I was nodding away and then getting wake. The race was tight and at the end there were the famous ‘swing states’ of which one was never so sure which side takes the votes. And then – in between – came the announcement of the moderator Christian Sievers: “And the next president of the USA is – Barack Obama!” Indeed, Obama had won in Ohio and that already ensured the result. Then, with similar results from the remaining states the victory of Obama was clear. And I felt so relieved. At the airport I met some older American tourists who were heading to Barcelona. They were very disappointed and made it clear. I didn’t feel a temptation to enter a debate with them – after all, it was up to the US citizens to elect their president. Then time passed – and I had my attention mainly on the project work with the Learning Layers – and before long there was the time for the next US elections. And now it was about the successor of Barack Obama. Well, the results was what it was – the citizens had spoken (popular vote) and the election system had spoken (the result in terms of electors). One may speculate just as much one can – but the result remains. The Obama presidency will come to an end with a hand-over to a completely different presidency. Michelle Obama Surprises People Recording Goodbye Messages to Her. I think this is enough of the Obama moments to be kept in memory. I will not continue with comments on American politics on my blog. But I am pleased to express my thankfulness and respect to the Obama couple now that they take the most important office in a democracy – that of a citizen. The Erasmus+ TACCLE3 coding project is organising an in-service training course in 2018 on how to start with teaching coding at primary school. All costs are covered by an Erasmus+ KA1 grant. But your school should apply for a grant with your own national agency for Erasmus+ before February 2nd. Contact jens.vermeersch atnospam g-o. be, if you have any questions. Join us on the Taccle3 coding training course in Dillingen in March 2018.